Planning for the so-called "TC4 Observation Campaign" started in April, under the sponsorship of NASA's Planetary Defense Coordination Office. The exercise commenced in earnest in late July, when the European Southern Observatory's Very Large Telescope recovered the asteroid. The finale was a close approach to Earth in mid-October. The goal: to recover, track and characterize a real asteroid as a potential impactor -- and to test the International Asteroid Warning Network for hazardous asteroid observations, modeling, prediction and communication. The target of the exercise was asteroid 2012 TC4 -- a small asteroid originally estimated to be between 30 and 100 feet (10 and 30 meters) in size, which was known to be on a very close approach to Earth. On Oct. 12, TC4 safely passed Earth at a distance of only about 27,200 miles (43,780 kilometers) above Earth's surface. In the months leading up to the flyby, astronomers from the U.S., Canada, Colombia, Germany, Israel, Italy, Japan, the Netherlands, Russia and South Africa all tracked TC4 from ground- and space-based telescopes to study its orbit, shape, rotation and composition. "This campaign was an excellent test of a real threat case. I learned that in many cases we are already well-prepared; communication and the openness of the community was fantastic," said Detlef Koschny, co-manager of the near-Earth object (NEO) segment in the European Space Agency (ESA)'s Space Situational Awareness program. "I personally was not prepared enough for the high response from the public and media -- I was positively surprised by that! It shows that what we are doing is relevant." "The 2012 TC4 campaign was a superb opportunity for researchers to demonstrate willingness and readiness to participate in serious international cooperation in addressing the potential hazard to Earth posed by NEOs," said Boris Shustov, science director for the Institute of Astronomy at the Russian Academy of Sciences. "I am pleased to see how scientists from different countries effectively and enthusiastically worked together toward a common goal, and that the Russian-Ukrainian observatory in Terskol was able to contribute to the effort." Shustov added, "In the future I am confident that such international observing campaigns will become common practice." Using the observations collected during the campaign, scientists at NASA's Center for Near-Earth Object Studies (CNEOS) at the Jet Propulsion Laboratory in Pasadena, California were able to precisely calculate TC4's orbit, predict its flyby distance on Oct. 12, and look for any possibility of a future impact. "The high-quality observations from optical and radar telescopes have enabled us to rule out any future impacts between the Earth and 2012 TC4," said Davide Farnocchia from CNEOS, who led the orbit determination effort. "These observations also help us understand subtle effects such as solar radiation pressure that can gently nudge the orbit of small asteroids." A network of optical telescopes also worked together to study how fast TC4 rotates. Given that TC4 is small, astronomers expected it to be rotating fast, but were surprised when they found that TC4 was not only spinning once every 12 minutes, it was also tumbling. "The rotational campaign was a true international effort. We had astronomers from several countries working together as one team to study TC4's tumbling behavior," said Eileen Ryan, director of the Magdalena Ridge Observatory. Her team tracked TC4 for about 2 months using the 7.9-foot (2.4-meter) telescope in Socorro, New Mexico. The observations that revealed the shape and confirmed the composition of the asteroid came from astronomers using NASA's Goldstone Deep Space Network antenna in California and the National Radio Astronomy Observatory's 330-foot (100-meter) Green Bank Telescope in West Virginia. "TC4 is a very elongated asteroid that's about 50 feet (15 meters) long and roughly 25 feet (8 meters) wide," said Marina Brozovic, a member of the asteroid radar team at JPL. Finding out what TC4 is made of turned out to be more challenging. Due to adverse weather conditions, traditional NASA assets studying asteroid composition -- such as the NASA Infrared Telescope Facility (IRTF) at the Mauna Kea Observatory in Hawaii -- were unable to narrow down what TC4 was made of: either dark, carbon-rich or bright igneous material. "Radar has the ability to identify asteroids with surfaces made of highly reflective rocky or metallic materials," said Lance Benner, who led the radar observations at JPL. "We were able to show that radar scattering properties are consistent with a bright rocky surface, similar to a particular class of meteorites that reflect as much as 50 percent of the light falling on them." In addition to the observation campaign, NASA used this exercise to test communications between the many observers and also to test internal U.S. government messaging and communications up through the executive branch and across government agencies, as it would during an actual predicted impact emergency. 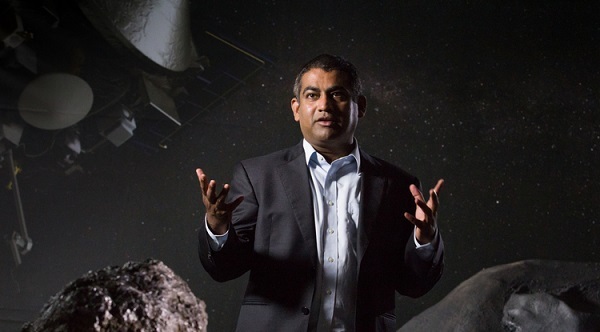 "We demonstrated that we could organize a large, worldwide observing campaign on a short timeline, and communicate results efficiently," said Vishnu Reddy of the University of Arizona's Lunar and Planetary Laboratory in Tucson, who led the observation campaign. Michael Kelley, TC4 exercise lead at NASA Headquarters in Washington added, "We are much better prepared today to deal with the threat of a potentially hazardous asteroid than we were before the TC4 campaign." NASA's Planetary Defense Coordination Office administers the Near-Earth Object Observations Program and is responsible for finding, tracking and characterizing potentially hazardous asteroids and comets coming near Earth, issuing warnings about possible impacts, and assisting coordination of U.S. government response planning, should there be an actual impact threat.